Is there a cuter mixed breed dog than a Husky Mix? We are not sure. With a steady increase in popularity of Husky dogs, it is no surprise that hundreds of dogs have bred with this loyal and energetic breed. From purebred Pitbull Terriers and Welsh Corgis, to German Shepherds and Golden Retrievers they have all mated with a Husky to produce some beautiful dogs. Renowned for their endurance, workaholic attitude and high intelligence levels, Huskies are a great dog to cross breed with. So here we have compiled a list of our five favorite mixes including the feisty Corgi x Husky Mix and the protective German Shepherd x Husky Mix. Love the cheeky, happy-go-lucky temperament of the husky but don’t think you have the space for their body? The feisty Corgi-Husky Mix could be for you. You’ll know of the Pembroke Corgi from its royal attribution. Queen Elizabeth II has had many in her lifetime. The Corgi is loved for its feisty nature; they are friendly and playful. Being herding dogs they also have a strong instinct which can result in excessive barking and stubbornness – they also don’t take kindly being left alone! Intelligence and sociability are provided by the other half of this mix, the Husky. Yet Huskies too can be stubborn. So this Corgi x Husky Mix is alert, protective and strong willed. These guys suit active homes with a secured yard, don’t forget the Husky tendency to escape. They are more suited to adult only homes as the Corgi part of them sometimes feels the need to herd young kids. Owners with an understanding of their specific need to be close, and who have the time to provide ample exercise and stimulation, are the best dog-parents for this breed. Despite their small size they can still destroy a door if left alone for long periods. They will also bark which can become problematic for some owners. Being an adorable ball of fluff, they are often described as a squatter husky who never grows up. Most Corgi mixes inherit the double coat which needs regular grooming. You will also need to invest in a good vacuum; you’ll be using it a lot! A perfect addition to adult only homes, this pooch is intelligent and alert; he most certainly is a huge character in a small body! The Pitsky is a striking Husky Mix between either an Alaskan or Siberian Husky and a Pitbull Terrier. Thanks to both parents being very friendly if you are after a watch dog, you are in the wrong place. Standing no taller than 21″ and weighing in between 30 and 70lbs, the Pitsky is just a large lap dog. But, don’t let their love and loyalty fool you. Whilst they are happy cuddling on the sofa, the Pitsky is very active and loves his walks. He loves to play and adores romping in the yard with the kids. A bored Pitsky will chew or howl and if they’ve retained their escape genes from the Husky parent, they will attempt to find something to interest them. In general, this mix has retained the intelligence and loyalty from their Pitbull parent, but, there is also the chance that they have retained the stubbornness from their Husky parent. For this reason, training can be a challenge. The Pitsky is a perfect addition for experienced owners, who understand the need for early and continued socialization and training. The Pitbull x Husky Mix responds best to positive reinforcement and reward-based training. A secured yard will also prevent escape attempts! This dog will thrive in active homes, with owners who love hiking, walking or just being outdoors. Busy family homes are also a good option. Yes, you read that correctly, there are some Pug x Husky Mixes! Due to the size difference in these breeds, the Husky should always be the Mom and the Pug, the Dad. This is due to the known health risks/complications when mating different sized breeds. The aim with this breed was to cross the loyalty of the pug with the intelligence of the husky. Due to the size difference in the parent breeds, the Husky Pug mix really can range in size and weight too. They may be anywhere between 14-60 pounds in weight and can range from 10-23” in height. In all honesty, you just don’t know with a first-generation mix. The bonus with the Husky Pug mix is that both parents are extremely loyal and are wholeheartedly devoted to their owners. However, because of this, the mix can suffer with separation anxiety resulting in excessive barking, destruction and defecation in the home. Both the Husky and Pug can be stubborn which can make training a challenge. For this reason, the Husky-Pug mix suits experienced owners who have the time and patience for training and socialization. 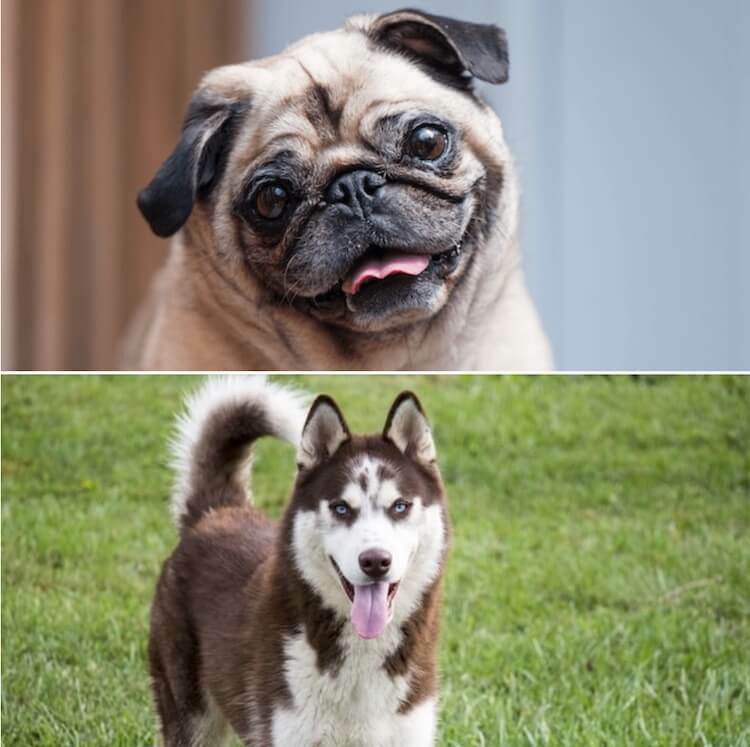 The Husky-Pug mix needs a lot of consideration before taking on due to the potential characteristics and health issues that it could inherit from either parent. 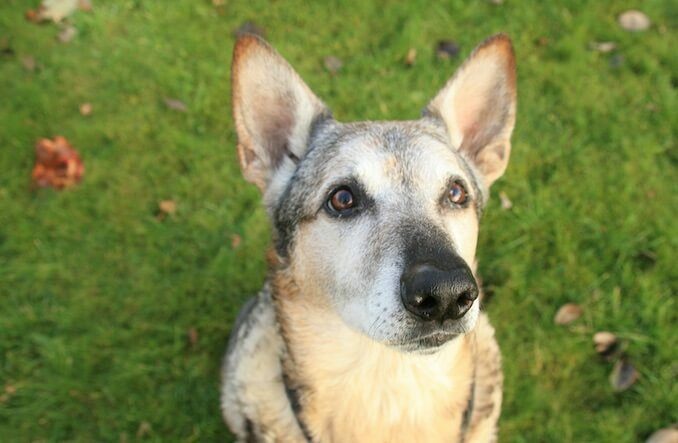 As a result, an experienced home who understands both parent breeds is essential for this loyal, friendly and stubborn pooch. Unfortunately, what often happens with the Husky Pug cross, is they inherit the high energy from the Husky and the flat faced-ness of the Pug. It is well established that Pugs suffer with Bracychephalic Airway Syndrome so they are prone to obstructive breathing due to the shape of their head. This leads to respiratory distress and can often be severe. When caring for brachy dogs, it is often advised to provide mental stimulation at home and go for short walks in cool weather. However, when you pair the husky’s need for regular exercise with a brachy pug face; you end up with a dog needing plenty of exercise which you can’t provide for fear of respiratory distress. There is always the chance however, that you may have a Husky-Pug mix who inherits a more Husky type face; you then run less risk when exercising. A friendly and playful Husky Mix mix, the German Shepherd x Husky is a magnificently wolf-like protector. Large in size, so is their heart; they are loyal and loving. High in energy, they are well suited to active families who love being outdoors. They are perfect companions for children who understand the needs of large breeds. They will run around the yard, chill on the sofa and protect with their life. The German Shepherd is renowned for its loyalty, intelligence and trainability. It is hoped that this breed has inherited these positive Shepherd traits, but, there is the chance they have the stubbornness from their Husky parent. You may also find they have inherited the husky howl. Wait for the ice cream truck to go past or a certain tune to play on the TV; it is one of their endearing qualities. Early training and socialization are key with this mix. A secured yard is also a must; not only to burn off their energy but to prevent escapes. Huskies tend to dig if they’re bored. Exercise and stimulation is key for these strong wolves; you can try running with your dog. Their intelligence lends them perfectly to brain games; swot up on the best ones and you’ll have a much happier dog. As this cross is a result of two larger breeds; they are predisposed to certain health conditions including hip dysplasia. This is a huge concern in German Shepherds resulting in lameness, stiffness and pain. The hope with cross breeding is to outbreed certain health conditions but this does depend on the parent breeds and we know that nutrition and the environment can also contribute to the development of hip dysplasia. In summary a mixed breed with both parent breeds who have been around for hundreds of years and have immense popularity, we are sure that the bold and magnificent German Shepherd Husky Mix will soon be a favorite. 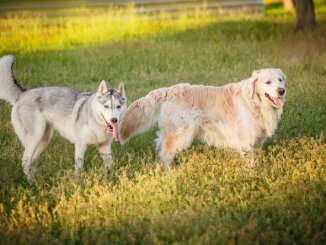 Rare and potentially expensive, the Golden Retriever Husky Mix is a recent cross breed to grace our dog parks. With both parents being super sociable, it’s no surprise that the Goberian loves everyone and everything. The ultimate goal for the Goberian was to be an intelligent, friendly and family-oriented dog. Medium-large in size, a Goberian will stand up to 24″ in height and weigh up to 80 pounds (females are generally smaller in size). They are confident, out-going and playful. A brilliant addition to any active family. Whilst other Husky Mixes can be stubborn; this isn’t as noticeable in the Goberian. What they have retained from their Husky parent is their cheekiness, you most certainly will never have a dull moment; still expect escape attempts. Like all dogs, they respond best to reward-based training. What we love most about the Goberian is their soft and floppy retriever like ears; they have this puppy look which never disappears. 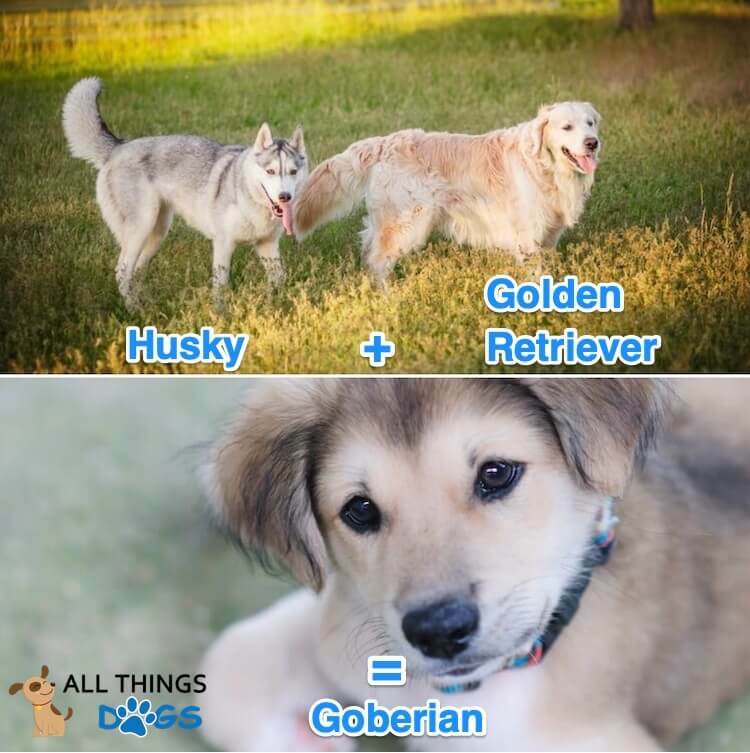 Their puppy like energy also doesn’t seem to disappear either, the Goberian is an active breed who needs regular exercise. They love their daily walks and time spent playing in the dog park. As with the other Huskies, the Goberian doesn’t tolerate being left alone for long periods; this can result in destructive behaviors and separation anxiety. A dog walker or doggy day care may help in these situations. Their energy and cheekiness make them a good temperament for any family. They will happily play ball in the yard with the teenagers, chill on the sofa on a Friday night with the adults and walk through the woods with the whole family on a Sunday morning. Adaptable and sociable, the athletic Goberian is a great companion and is our favorite Husky mix. As we can see, there is much to consider when looking for a Husky Mix breed. The mix can potentially inherit positive or negative traits from either parent. As with any breed, researching a reputable breeder is essential. Rescue may be a consideration as their assessment will tell you much of what you need to know about them! 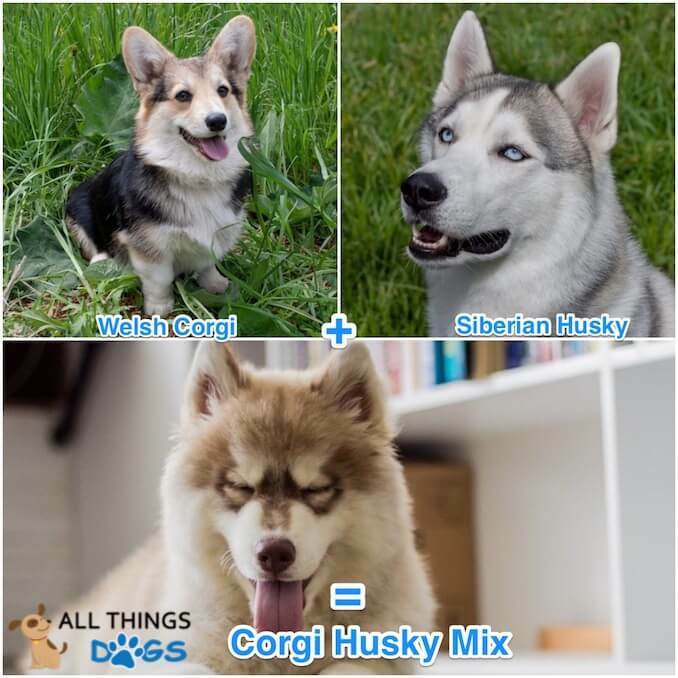 If you do decide to get one of these fantastic mixes, do look at our Husky Names article and be sure to let us know if you have any of these mixes in the comments below. We have a Goberian, he’s now just turned 10 years old and is beautiful, smart (sometimes too smart) and loves kids. Super friendly, but they shed like a regular husky. Wish I could post a picture of him in here, you’d be amazed.